Condo Blues: How to Make Air Freshener Spray the Natural Way! 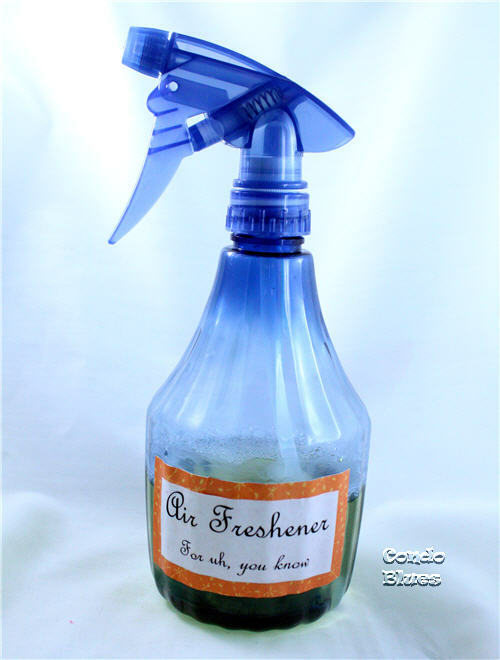 How to Make Air Freshener Spray the Natural Way! I put new unlit soy candles in my bathroom to work as an air freshener. Once the smell of the essential oils in the candle fades, I burn them (attended) after dinner to remove cooking smells and for overall candle light goodness. I’m sure you are aware of those times when a bathroom air freshener needs a little immediate help to clear the room of…uh…um…odor. I don’t like most commercial room sprays because they smell as a fake flower factory exploded in my bathroom. Moreover, that’s what they make those room sprays from – a fake synthetic chemical concoction. Boo. Hiss. Does a room freshener exist without the synthetic ingredients? It sure does if you make it yourself! And at a fraction of the cost of a commercial air freshener spray to boot! I have success with using a purchased essential oil as well as my homemade essential oil extracts. Both worked well although I need to use a bit more of the homemade extract since it is a little weaker than the pure essential oil. When I’m buying, I stick to pure essential oils instead of a fragrance oil. The pure essential oils cost a little more but they are made with natural ingredients. The fragrance oils are mostly likely made with synthetic ingredients or a blend of natural and synthetic ingredients. Colored spray bottle – A white or clear spray bottle will allow light into the mix and deteriorate the aromatic and therapeutic properties over time. If you want to make it as plastic free as possible, I recommend these colored glass spray bottles on Amazon. 1. Pour water into the spray bottle. 2. Add a few drops of essential oil. 3. Pop on the top and spray away! Tip: Try to use an opaque spray bottle if you can because light can oxidize the oil and it can smell not that great. That’s why essential oils come in amber or blue bottles. A little word of warning. The lavender essential oil extract version of my air freshener spray marred the finish on the granite counter top my half bathroom. I’m not sure if it is the vodka in the extract or the lavender in the spray that messed with the finish. The same version of the homemade lavender air freshener spray did not mar the composite counte rtops in my other bathrooms or kitchen. I made a real essential oil version for that bathroom and it works fine. 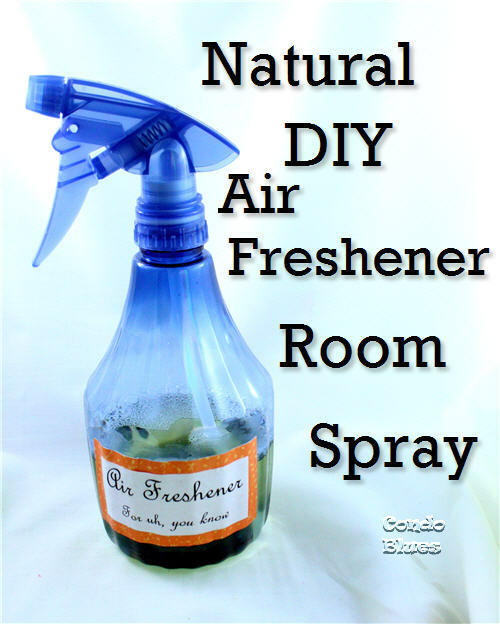 If you'd rather buy than DIY, check out the natural room spray options below! What a great idea! So simple and easy too! Thanks for sharing this at the In and Out of the Kitchen Link party. I look forward to seeing what great information your share next week! Thanks for this tip--I can't use the commercial sprays for many reasons (asthma and others). I would probably spray the oil onto the bathroom rug so I don't have to worry about any discoloration. What a great post! Thanks for sharing. I definitely need to be making my own air freshener spray, for green as well as for frugal reasons. Those commercial air fresheners contain so many harsh chemicals. I'm slowly trying to eliminate those types of things from our home, and I've gone without air fresheners for so long. I'll have to give this a try. Thanks for linking up at Whatever Goes Wednesday!